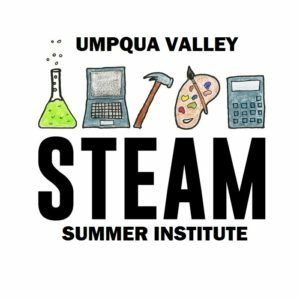 It’s called the STEAM Summer Institute, but STEAM Smorgasbord would be an accurate way to describe the collection of courses taking place Aug. 14-18, mostly at Umpqua Community College. That’s true for two reasons. First, this collection of workshops for educators, mentors and program coordinators offers up an appetizers-to-desserts array of topics in the world of STEAM (which stands for science, technology, engineering and math, with artistic innovation connecting the disciplines). Maps, stargazing, exploring Oregon, math games and video coaching are just a few of the subjects covered. And second, these are nutrition-dense courses – packed with practical information, but seasoned with fun. The STEAM Summer Institute’s professional development workshops are a great way for educators to learn about STEAM education opportunities they may not have realized exist in Douglas County. Participants will not only discover how to connect with local resources, but also plan STEAM activities to use in their own classrooms during the 2017-18 academic year. For the UCC courses, check-in at Wayne Crooch Hall begins at 8 a.m. daily, followed by a light breakfast and information from presenters in a meet-and-greet format until morning workshops begin at 9 a.m. Lunch will be provided from noon to 1 p.m. Afternoon workshops will be from 1 to 4 p.m.
Two workshops, both taking place on Aug. 15, will be held at locations other than UCC. Courses based on the Global Learning and Observations to Benefit the Environment (GLOBE) Program will be held at the Tri City Elementary computer lab and the Alder Creek Community Forest near Canyonville. Professional development certificates will be available at the end of each workshop session upon request. Educators will receive a $100 stipend for each course attended (capped at $500 per participant). For course descriptions, a full STEAM Summer Institute schedule and registration information, visit http://www.dcpss.org/summerinstitute/.